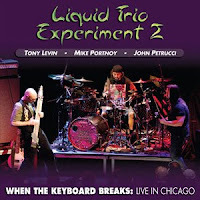 Liquid Tension Experiment, the Dream Theater side project which led to the full-time hiring of the band’s keyboard player Jordan Rudess, is releasing a new CD entitled Liquid Trio Experiment 2 – When The Keyboard Breaks: Live In Chicago. 2009 will see Ytsejam Records branch out with releases by select DREAM THEATER side projects on their new Lazy Tomato Entertainment label. But to whet your appetite until those titles are ready to go, the label will launch Ytsejam’s side-project offspring with the release of the LIQUID TRIO EXPERIMENT 2 “When The Keyboard Breaks: Live In Chicago” CD. This is the infamous “jamarathon” which took place at LTE’s June 25, 2008 show in Chicago when Jordan Rudess’ keyboard broke down. Mike Portnoy, John Petrucci and Tony Levin proceeded to play and improvise almost one hour of insane musical madness to a stunned audience. The first Liquid Trio Experiment album, Spontaneous Combustion, was a collaboration between Rudess, Portnoy and Levin which was recorded in 1998 when Petrucci had to skip out on recording sessions cos his wife went into labour. So the new CD is like a spin-off of a side project of a spin off of Dream Theater.